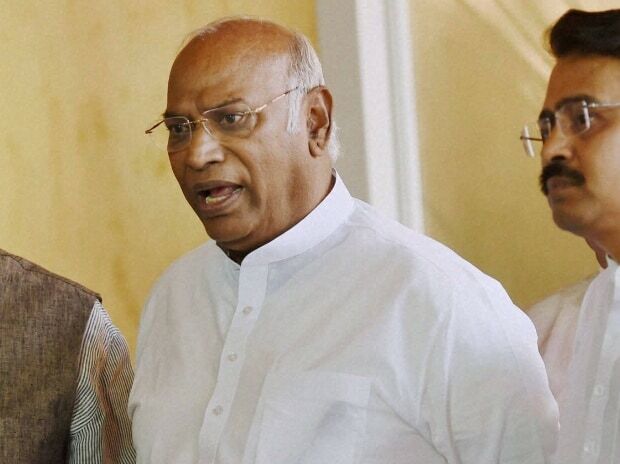 Senior Congress leader Mallikarjun Kharge today said "there is no question" of Rahul Gandhi or anybody from the party attending an RSS event. "Let the letter (of invitation) come first. This (invitation) is all in view of elections," Kharge said, when asked about the RSS' reported plan to invite the Congress president to a lecture series next month. Kharge was talking to reporters here after meeting party workers from Maharashtra and Mumbai units ahead of the 2019 polls. The Congress is engaged in an ideological battle with the Rashtriya Swayamsevak Sangh and the party even gave up the chief minister's post in Karnataka to keep the BJP and the saffron outfit away from power, he said. "In Karnataka, a small regional party (Janata Dal-Secular) has 37 MLAs and we have 80. But we gave up the chief minister's post to that party to strengthen secular forces. So there is no question of (Gandhi or any other Congress leader) going to the RSS headquarters," Kharge added. He termed the RSS ideology as a "poison" for the country and for Dalits and other oppressed classes. "If Rahul sahab asks me about going there (to the RSS event), I will tell him that there is no question of going there. That there is no intention of joining such people," Kharge said. RSS sources had claimed two days ago that it could invite Gandhi to a three-day lecture series by Sangh chief Mohan Bhagwat in New Delhi next month. The idea was to invite people from different ideologies and the list may even include CPI(M) General Secretary Sitaram Yechury, sources had claimed.